Features:*HD 1080P(1920*1080) image quality,camera view angle covers 166,showing your clear image of the outdoor environment. *6pcs IR leds for support night vision,IR distance is up to 5 meters. *2pcs 18650 batteries or USB charging for power supply,ultra-low power consumption,working length time is about 6 months. *Support picture snapping and video recording function,real time visual intercom with visitor,TF card record(TF card is not included). *With motion detection sensor,when some objects move in front of the device,it will trigger signal to the phone. 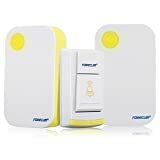 *Wireless doorbell kit with one WiFi doorbell and one outdoor doorbell chime,52 ringtones optional for you.Easy to pair with the doorbell,easy for installation,more convenient and safe for using. *With indicator lights to show you different states of the doorbell,such as blue lights means that the system is in normal working condition.